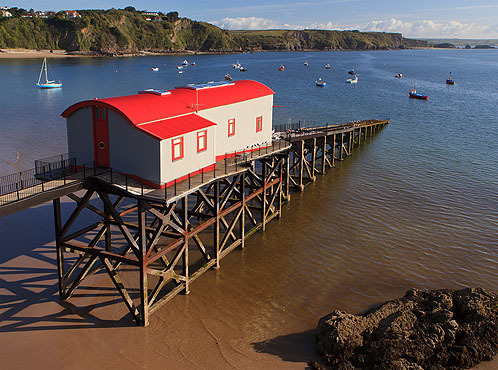 The Old Lifeboat Station at Tenby , recently renovated and converted to a residence. The Castle Hill Lifeboat house was built in 1905 at a cost of £3,871. The Station was constructed to take account of the larger boats coming into service by the end of the 19th century, and allow for direct launching of the boat into the water. It was built to replace the station at the top of Castle Sands . The slipway is the longest in Britain. An almost identical station is at Porthstinan, St Davids. The station has housed the lifeboats the 'William and Mary Davey' (1902-1923), the first petrol engined boat , the 'J R Webb' (1923-1955), the 'Henry Coomber Brown' (1955-1986), and the Tyne class boat 'RFA Sir Galahad'.